In the year 6303, when earth is bare of anything larger than an insect or a mouse and most people have left for the stars, Duncan Rojas receives a most unusual visitor. His name is Bukoba Mandaka, and he is the last of the Maasai. Mandaka wants Rojas, senior researcher for Braxton's Records of Big Game, to find the tusks of the Kilimanjaro Elephant, tusks that weigh over 200 lb. each. Why? Mandaka will not say, but he will pay enormous sums for them. And Rojas cannot resist the challenge of tracing something lost for 3000 years. Back and forth through time, in card games, wars, and rivalries, Rojas searches. But as he begins to glimpse the elusive, lost power of ancient Africa, he is seduced, and before long the quest has become his own. 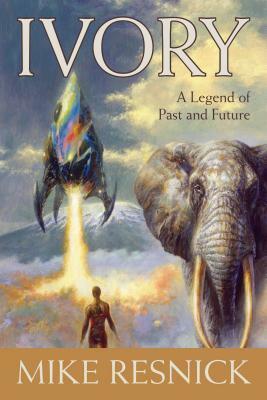 With Ivory, Mike Resnick has created a powerful novel spanning worlds and centuries, an exploration of the nature of history and legend, and a riveting parable for our times. Mike Resnick has won an impressive five Hugos and been nominated for twenty-six more. He has sold fifty-eight novels and more than two hundred short stories. He has edited fifty anthologies. His work ranges from satirical fair, such as his Lucifer Jones adventures, to weighty examinations of morality and culture, as evidenced by his brilliant tales of Kirinyaga. The series, with sixty-six major and minor awards and nominations to date, is the most honored series of stories in the history of science fiction. Visit Mike Resnick online at www.mikeresnick.com.